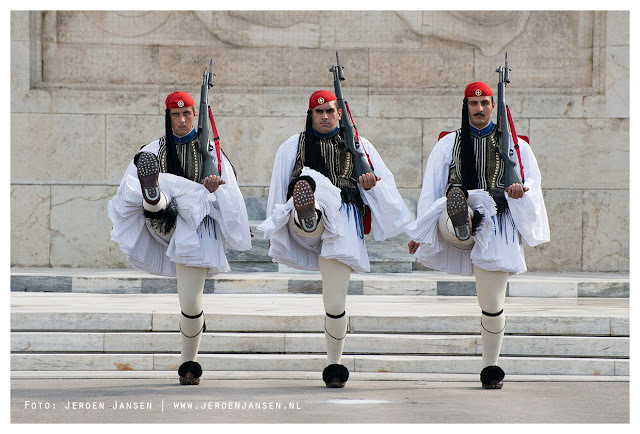 "The Evzones is a special unit of the Hellenic Army, also known as Tsoliades, who guard the Monument of the Unknown Soldier in front of the Hellenic Parliament and the Presidential Mansion." On the photo is the Changing of the Guards in Athens Greece on sunday 11 am. During this day they wear their the official costume. I went the day before and than they had a blue suit (during winter time). "Every soldier guards for about an hour, 3 times in total every 48 hours. Throughout these 60 minutes, they have to stand perfectly still until it is time to switch with another guard. During the changing, they work in pairs so they can perfectly coordinate their moves. The steps that the official ceremony requires at the time of changing are carried out in really slow motion to protect their blood circulation after 60 min of immobility."